It Sure is Magnetic, But is it Solid or Liquid? Figuring out if glass is a solid or liquid is pretty straight forward. This putty in the video however, behaves a lot like pitch (the same thing that was used for the world’s longest continuously running experiment). On applying a greater and abrupt impact, it shatters like a ceramic. While it flows like a liquid if you let it. But that is not even the point. The point is, it can be magnetized! And it sure is another one of those awesome science toys you can have on your desk all the time. By the way, the other ones are Gombocs, constantwidth objects and feel flux. It must so much fun to play around with such a gooey magnetic material (putty). Some good soul will gift it to me for my birthday…may be. It stretches, bounces, breaks, flows, can be magnetized and what not! It’s like the ferro fluid, but more awesome. Even this, like ferro fluid, has very very tiny magnetic particles dispersed in a putty like substance which makes it magnetic. Who wouldn’t want to try out that Neodymium magnet swallowing trick! Since it looks like it’s live, they call it the magnetic thinking putty. Perfect name, I must say. Posted on May 2, 2014 May 3, 2014 Categories PhysicsTags amazing, black, ferro fluid, gift, gooey, liquid, magnet, magnetic, neodymium, physics, putty, rubbery, science, Toy, VAT19, videoLeave a comment on It Sure is Magnetic, But is it Solid or Liquid? 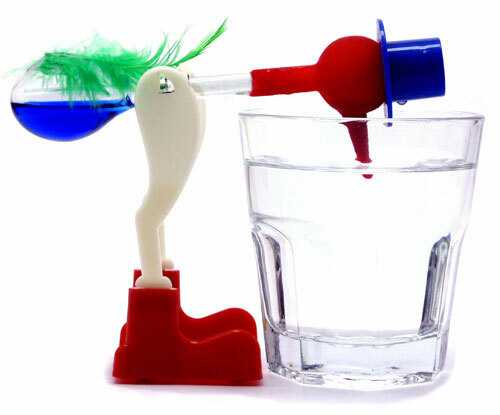 The Drinking Bird is a toy which almost every one of us has heard of. If you haven’t, may be this picture of it rings a bell. Otherwise, it is a funny looking bird-head made of felt, mounted atop a glass or plastic straw, with a little bulb at its lowest point. The whole contraption is suspended at two points, which allows it to swing smoothly like a pendulum – drinking water at regular intervals, from a glass, for ever. The amusing thing about this little toy is that, once it starts, it keeps swinging and “drinking” for ever. Upon giving it a cursory look, it seems to be a perfect perpetual machine – a contraption that can run indefinitely without an external source of energy. In reality, it isn’t a perpetual motion machine. There is a complex physical and chemical activity going on inside the toy, which keeps the simple heat engine running forever without a battery – Something so complex to deduct, that even one of the greatest Physicist ever, Albert Einstein himself couldn’t figure out the correct mechanism that keeps it running. Don’t worry, it isn’t as difficult to understand the mechanism. Assuming you have properly understood the parts of the toy, you will notice that the little bulb at the bottom of it has a colored liquid in it. This colored liquid is a chemical called Methylene chloride – A chemical that dissolves caffeine and can be used to decaffeinate coffee, teas and colas. The special property of this chemical which makes the toy work is its extremely low boiling point. It has a high vapor pressure at room temperature. At room temperature the vapor pressure in the tube and head is high. The fluid remains in the bulb and the bird is upright due to the weight of the fluid. The first thing you do is, you make its head dip in water. That way, the head made of felt absorbs water. The water cools due to evaporation (like our sweat cools our body), drops the temperature of the head and the bird comes up. While swinging in the upright position, as the head cools further, the vapor pressure at the head decreases, while the pressure at the bulb becomes relatively higher. This causes the chemical to rise up the tube and it changes the center of gravity (CG). Due to the change in CG the bird tips its head back into the water. Absorbs water and the process starts once again. It keeps on going till the bird can no longer reach the low water level. You, then have to fill up the reservoir.